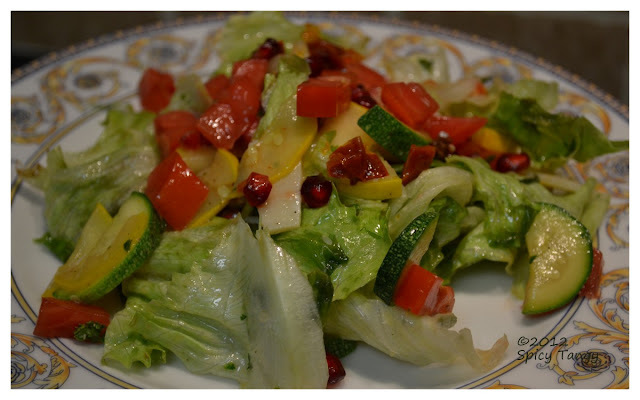 A simple salad recipe that is a treat for zucchini lovers! Cut the zucchini into fine slices. In a pan, heat 1 tbsp olive oil and add the zucchini. Chop the parsley and add it to the pan. Add salt to your taste and saute on high heat till the zucchini is soft and turns slightly brown. Set aside to cool. In a small bowl, mix the remaining olive oil, vinegar and juice of the lemon. Mix well and set aside. Chop the tomato into small pieces and set aside. Break the lettuce leaves into bite-sized pieces and set aside. Now it is time to assemble the salad. 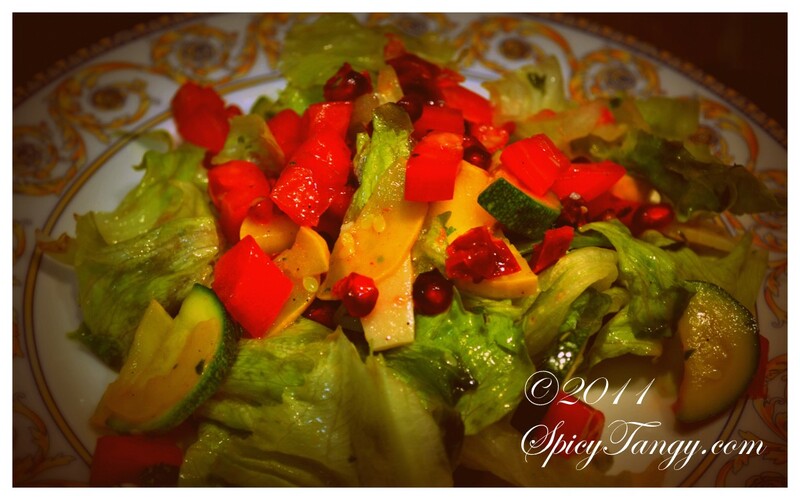 In a large bowl, add the lettuce leaves, tomato, zucchini and pomegranate. Pour the olive oil, vinegar and lemon dressing on top and mix well. Top it up with shavings of Parmesan cheese. Get creative with ingredients. I have tired this salad with alternate ingredients like avocado, walnuts and even sliced pears. The thing to remember is to balance the sour and sweet taste which gives this salad it's punch. Enjoy!